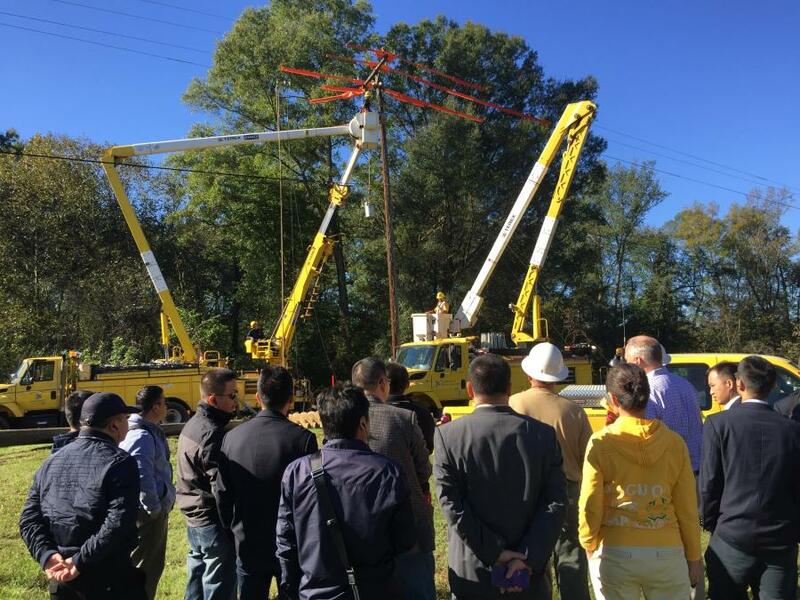 Delegates from several Chinese electric utilities observed best practices of live line work and distribution pole change out on a Rappahannock Electric Cooperative jobsite in Virginia. Delegates from the China Southern Power Grid (CSD), Mongolia Power, National Energy Administration (NEA) Electricity Safety Department, and Guangzhou Foreign Commercial Service, recently visited the United States to participate in a two-week training program sponsored by the U.S. Trade and Development Agency (USTDA). Terex Utilities participated in USTDA's China Live Power Line Maintenance Reverse Trade Mission by hosting the delegation and sharing U.S. best practices and technologies in live line maintenance. The delegates included 14 China Utility Power group representatives and 3 officials from the NEA in China. The delegates took part in training the first week, observing best practices of distribution pole change out hosted by Rappahannock Electric Cooperative, continuing onto the Southeast Lineman Training Center (SLTC) in Trenton, Ga.
“At SLTC the delegation received training on hot line tools usage, safety processes and procedures for different live line work applications,” said Tilden. Representatives were able to operate a mix of Terex equipment, including insulated aerial devices and digger derricks, which were used in live line work applications. While visiting Terex, the representatives toured the assembly processes and fiberglass boom manufacturing areas and spent time “hands on” understanding the equipment's application. “The product demonstrations will help the delegates in selecting equipment and features designed to improve efficiencies in electrical system construction and repairs,” said Tilden. “USTDA has found visits like these to be incredibly successful in connecting partner countries with U.S. suppliers like Terex, which can support China's live line development and safety goals, while creating opportunities for U.S. businesses,” said Carl B. Kress, USTDA regional director for East Asia. For more information about Terex products and services, as well as the company's training and schools, visit www.terex.com/utilities.